Selection Of Promising Lines With Combination Of Drought And Submergenece Tolerant Traits In F7 Generation Through Molecular Markers In Rice. Nguyen thi Lang , et al. Novel Plant Transformation Vectors Containing Γ-Tmt And Fad2 Gene. Tran Vu Hai, et al. 1. Expression of b-carotene in advanced progenies derived from different backcrosses of the high-yielding rice varieties to the transgenic golden rice lines. Tran Thi Cuc Hoa et al. 2. Initial marker-assisted selection in rice breeding at Cuu Long delta rice research institute. Nguyen Thi Lang et al. 3. 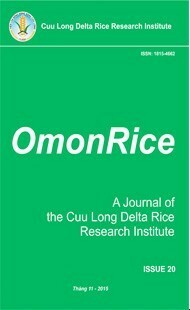 Quantitative trait loci influencing drought tolerance in rice (Oryza sativa. L).Nguyen Thi Lang et al. 1. Transformation efficiencies of the soybean variety PC 19 [Glycine max (L.) Merrill] using Agrobacterium tumefaciens and the cotyledonary node method Tran Thi Cuc Hoa et al.